If you're running Monster Valves or Mini Monster Valves on tires above 50 PSI you must have one of these. The idea is to clip this tire pressure gauge (0-160 PSI) onto your stock valve stem and watch your tire pressure decrease during deflation so you know when to stop. By the same token, watch your tire pressure while inflating with the Monster Chuck so you'll know exactly when to stop filling. Bottom line: This tool will save you time and effort. 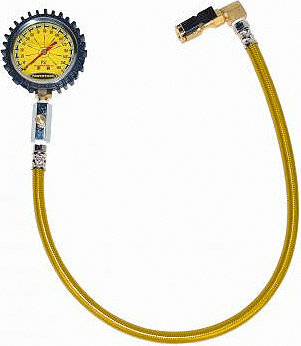 Also can be used as a regular pressure gauge. The bleed button lets you release air too.